We are 10 days away from Easter and I am sure you are all gearing up to color the eggs, decorate the baskets, put up the bunny ears and go on an Easter Egg hunt. We present here our special selection of Easter decorations, crafts, treats, and games! ps: I prefer dark chocolate...you know...just thought I'd mention it. There are, of course, any number of decorations from wreaths to table centerpieces that you must have already started digging out of your treasure chest (the one in your attic). Here we will not bore you with a round of the same old same old. Just a heads up to something cute like this Bunny Wagon Wall Decal that can instantly transform any room to the Easter theme. Create one of a kind candy dishes, using shredded brown lunch bags and sheets from an old dictionary. 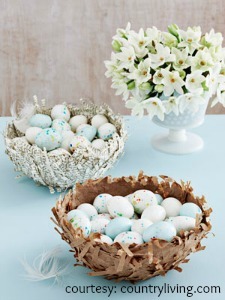 You can also use these nests to corral your decorated Easter eggs. Step 1: Tightly cover a small bowl with plastic wrap, then flip the bowl upside down on wax paper. In another container, mix equal parts water and clear glue. Step 2: Dip handfuls of shredded paper into the glue mixture, then immediately lay them on the bowl until it's covered. Step 3: Lightly press dry paper strips along the outside to create a "nesty" look. Step 4: Let dry for 12 hours; carefully pull the wrap off the bowl and away from the nest. Preheat oven to 160°C. Line a 12 cup tray with patty pans. Prepare cake mix as directed on the box and scoop 1/4 cups of the batter into 12 patty pans. Bake for 15-20 mins. Remove and cool on a cake rack. Beat butter with an electric mixer until pale and creamy, gradually add icing mixture and beat for 2 mins on high. Spread this generously over the cooled cupcakes. Place coconut in a ziplock bag with the food colouring and shake and rub until all the coconut is yellow. Press the coconut into the icing on each cupcake. Dot icing on the choc chips and place as eyes and push a cornflake in for the beak. To set up, first select one person to start off as the Bunny. The remaining players are the Eggs, who quietly (so the Bunny doesn't overhear) each select an everyday color for themselves. Next, decide on a home base for the Eggs, a starting point for the Bunny (about 10 to 15 feet away from the Eggs' home base), and a round-trip course for the players to run, such as to a tree and back or once around the house. 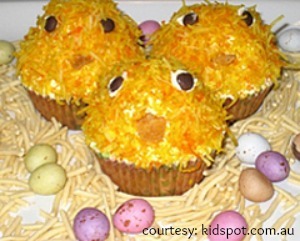 Have the Bunny and the Eggs gather at their starting points. To play, the Bunny begins calling out colors. As soon as he calls a player's color, that Egg takes off through the course, with the Bunny in pursuit. If the Bunny manages to tag the Egg before she can make it back to her home base, the players swap places and the Eggs all select new hues. If not, the Bunny tries again with another color. This game was first seen in Family Fun Magazine.